Hello fellow crafters, it’s Cicily with an All About the Furniture post for you today. I pay a lot of attention to craft rooms and storage solutions for my Pinterest followers and for Craft Storage Ideas. Recently the Hubby and I are talking about mixing things up at our house and switching around 5 rooms, including my beloved Superman Scrapbook room! Now I’m really paying attention to furniture, especially shelving and bookcases. 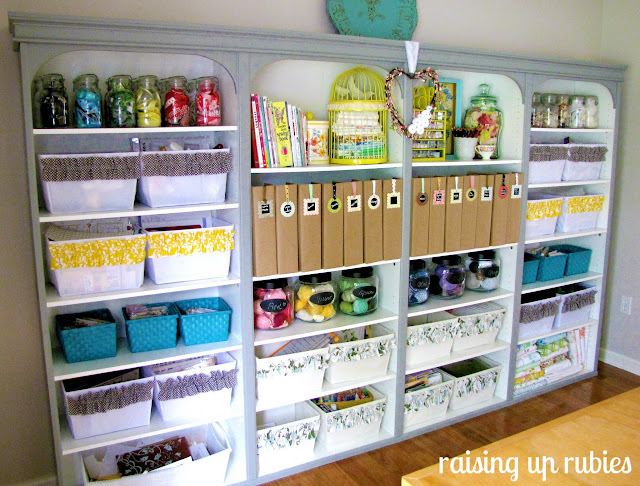 I love this shelving from Raising up Rubies. Can you believe these are plain Target bookcases with crown molding and arches added? Then there’s this built-in bookcase redo from the gals at Lolly Jane, I love this Herringbone Stencil in mustard yellow (I have an upcoming project using this exact color! ), the bunting and the owls, yes the owls! 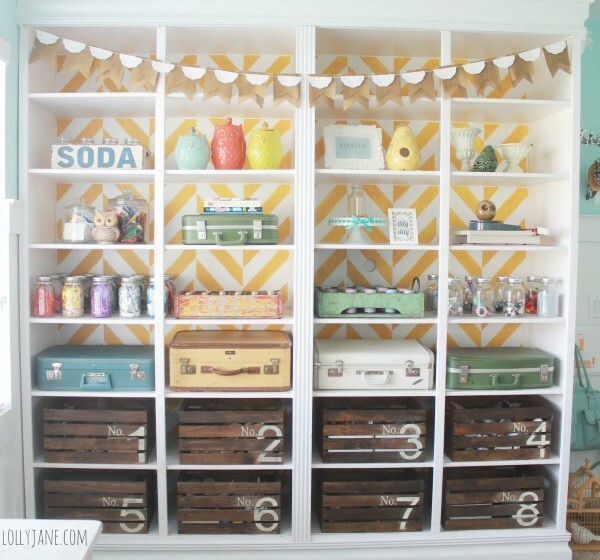 She actually has quite a few craft supplies tucked into this beautifully staged bookcase. I love built-ins or faux ones! My dad’s done a few so I’m ready to try my hand at it. Don’t hold your breath though, not sure when we’re starting. However the good news is that in the Great Room Shuffle my scrapbook room has to go first! If you have a shelving solution post a link in the comments. Happy December! Can you believe we are so close to the end of the year? Only 30 more days to organize your craft stash before 2014! Just kidding! Today’s craft room is from the UK – and it is beautiful! Well? Do you agree? It’s beautiful! And I especially love that little dresser that holds her fabric! It’s a very unique piece! More later this week! Happy Monday! This is Cicily the Pink Dalmatian Scrapper with another craft tour. I thought I would share a cozy craft room that is near & dear to my heart. It’s my Mom’s craft space! She chose this cozy corner of the basement for the view out the back to the corn fields. And while it’s small, it’s an organized and inspirational space that is comfortable to craft in. I have to say that my favorite craft spaces are ones with personality and decorated to show something of the crafter within! I love my mom’s solution for pin storage! We both share a passion for “found” storage solutions and love finding treasures at 2nd hand stores. This is one of her latest finds, a record cabinet that is perfect for 12×12 paper pads! These were just a few of her great storage solutions. I hope this inspires all you crafters who have small spaces and inspires all crafters to make your space uniquely you! Happy Tuesday! I’m happy to introduce Stacey Michaud from It’s Just Paper. You can also find Stacey designing for Lily Bee, Teresa Collins, and Webster’s Pages! Let’s give her a warm welcome! Hello! I am a teacher by day and an avid scrapbooker by night! My husband, two feisty children and pets give me lots to scrap about. Paper serves as my muse and I love to create theme-based layouts that document my family’s history. Here’s a look into my craft room! My craft room is actually a shared space with my family. In my house, we refer to the room as our office. It is in a well-viewed and well-traveled part of my main living area. As such, I needed to almost hide my scrap supplies. The room needs to be neat and easily accessible for doing homework, paying bills and watching TV. I decided to use handsome bookcases as my storage units because my goodies can be concealed in pretty baskets and boxes. It is easy for me to use and looks more like a library than a scrap room. I need to clean up at the end of each day so my storage ideas have to be user friendly. I started with Expedit bookcases from IKEA. I slowly purchased insert boxes and baskets in all different sizes, ensuring that every piece serves a good purpose. I have a clear system for the boxes. Several of the larger ones hold the embellishments for the companies I design for. I need those supplies to stay sorted by collection and by company. I am a big believer in galloon size plastic bags. I place all the embellishments for one line into a bag, label and then store. It makes my design team work run smoothly. I like to grab a box and get to work! The small green boxes hold smaller, mixed embellishments that I have acquired over time. These are items I don’t need for design team work. As a part of my storage system I have sorted my extra embellishments and goodies by color, not paying attention to company or collection. If I need a pop of orange, I reach for the box with all my orange colored items. It has streamlined the process. The only small embellishments that don’t live in the boxes are my buttons, which I have stored in glass jars from Ikea. My children are older now, so I am able to keep my paper cutter out on a lower shelf. Having it so close to my desk makes it easy to reach, yet gives me working space. A square, black wooden box holds layouts and projects that are in progress. My most-loved tools and supplies go inside the drawers. I tried to keep them in boxes, but the lids and sliding in and out bugged me. I recently installed the drawers units, which are a part of the Expedit system. I love alphabet letters and have struggled with an efficient way to store all the packages. I once had them in drawers, but had to empty the contents out to find what I am looking for. Right now, I am storaging them in the woven Ikea baskets. It seems to be working. The other side of my room contains a large, wrap around desk, a command center and a couch. I sometimes display layouts on the corkboard. The calendar allows me to organize deadlines and the containers on that side hold everyday office supplies like my stapler, scissors, colored paperclips and my pens. The stacked white cubes serve as an end table for the couch, but also are home to completed layouts that are waiting to be put into albums. I always try to stick to a reasonable budget when organizing any space. I had planned for the wrap around desk while we were renovating our home. For the other items in the room, I like to hunt for the best bargains. Places like Ikea allow for affordable, functional, and attractive decorating. My greatest challenge was designing a space that I could easily access, yet fits my entire family’s needs. The room is in a place in my house where it is visible from several rooms. I needed to create a space that serves as a family room. I am constantly reassessing my storage solutions. I try to purge and reorganize every winter and summer. If I am not using something and have had it for a while, I donate it. I only want the essentials at hand. I have a hard time organizing consistently used items like adhesive, glue dots and foam squares. It gets so messy that I often open a new package. I need a better solution for the things I use every time I craft. I’m loving how clean and organized Stacey’s space is! And it definitely shows that a space can be multi-functional and accessible by the entire family and still look good! Thanks, Stacey, for joining us! For more information, check out Stacey’s blog here!